Yes, Hakuho (11-0) still leads. He’s peerless, the best. He dispatched Takekaze (5-6) with ease. There was no surprise in that, unlike yesterday when Osunaarashi was, for a moment, able to challenge the Yokozuna. What was surprising was Ichinojo’s (10-1) near-henka victory over Kisenosato (7-4). Kisenosato has a very slow tachiai. He draws more than his fair share of false starts – matta, in Japanese. However, I think the rookie and his coaches outwitted the Ozeki. After being “tempted” into two false starts where he appeared to charge straight at Kisenosato, Ichinojo dodged to his left – exactly opposite Kisenosato’s taped shoulder – and gave Kisenosato a shove to make sure he fell flat on his face. BRAVO. You’re on notice, Kisenosato, Ichinojo exposed the weakness in slow-rolling your tachiai. He hopes to gain the advantage of knowing his opponent’s plan of attack – but Ichinojo disguised his planned dodge beautifully. This is speculation but I think the youngster planned to bait Kisenosato into thinking he’d take the injured left shoulder head-on. 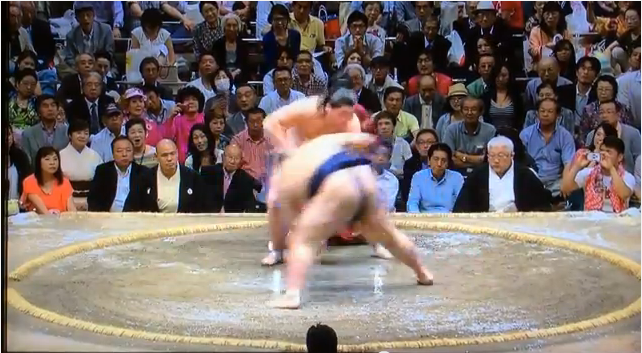 He faked it twice to reinforce the point…then dodged to Kisenosato’s right! Beautiful. I look forward to watching this youngster develop. He’ll face a desparate Goeido (6-5) tomorrow. In other matches, Kakuryu (10-1) is tied with the young upstart, one loss off pace. Unlike Ichinojo, Goeido really was a bit over-eager to face the Yokozuna. He false started, and on the fair-start Kakuryu was able to quickly gain control and show Goeido to the floor. Osunaarashi fell to 4-7 against Kotoshogiku (7-4). Kotoshogiku bulled through Osunaarashi’s aggressive slapping attack and pushed the maegashira #4 off the dohyo. Endo (2-9) got a win against Chiyotairyu (1-10). Ikioi (7-4), still the only rikishi to defeat Ichinojo, won his match against Takanoiwa (4-7). Aminishiki (8-3) is alone with 8 wins since Kyukutenho lost against Tochiozan (both on 7-4). Okinoumi (9-2) still has an outside chance for jun-yusho with his win over Sadanoumi (6-5) as Kakuryu and Ichinojo will be facing stronger opponents in the coming days. Both of them will be battling Ozeki tomorrow while Okinoumi will face maegashira #10 Kitataiki. In non-tournament related news, I’m eager to start a conversation based on comments made by ex-Kotooshu where he expresses an intent to use data and scientific methods to improve sumo training. It’s a brief article and I’m very eager to learn more. I’m a data hound and love to pour over the data available over at sumogames (linked in the menu above). However, I know there’s so much more data that could be collected…like information on match duration, injuries, taped body parts, and how many ad banners each rikishi has from sponsors.